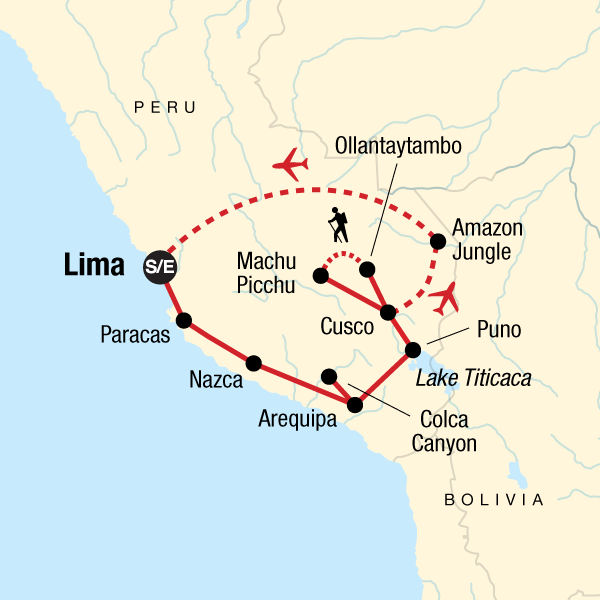 Take your time over the course of three weeks on this all-encompassing highlights holiday in Peru where you’ll get to experience everything from Lima to Cusco including a four day hike to the legendary Inca ruins of Machu Picchu and an optional flight over the Nazca Lines. A combination of guided small group tour and holiday adventure allows travellers to experience Peru in the best way possible with cultural history and explorations by boat into the Amazon offering a variety of organic encounters to help you really get to grips with this section of South America. Travelling by local bus and staying with a family on Lake Titicaca adds to the immersive feeling of being solely in Peru with fair treatment for trekking porters, accommodation hosts and local guides just as important to our company as the quality of equipment and food included within the tour. Beginning in April 2005, we began to visit this community as part of the Sacred Valley Tour where they have the opportunity to meet the women and learn about all the stages of the weaving process; from spinning the sheep wool, to dying the wool using natural dyes, and participating in a weaving demonstration. Travellers are also given the opportunity to purchase high quality textiles directly from the women who made them. The Absolute Peru package is about being outside; outside everyday comforts and the usual city sightseeing. So be open to a holiday full of memorable experiences.